Michael Rogers, dubbed “trolley man”, has been hailed a hero on social media. Picture: Nicki Connolly. 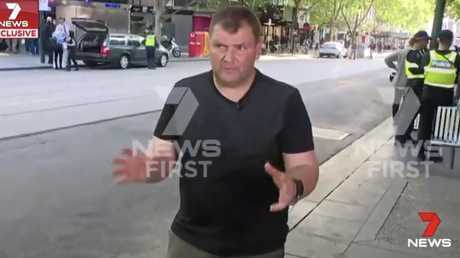 A BYSTANDER dubbed "the trolley man" for taking on an armed terrorist with a shopping cart during the deadly terror attack in Melbourne has said he is "no hero" as his story shines to light. Michael Rogers, 46, attempted to help police officers stop Hassan Khalif Shire Ali during Friday's Bourke Street terror attack. One person had already been stabbed to death and another two were injured. 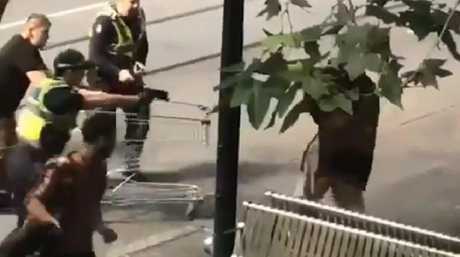 Mr Rogers, who is homeless with few possessions, began ramming a shopping trolley into the terrorist in a bid to help. "I threw the trolley straight at him, and I got him. I didn't quite get him down, though. I'm no hero," Mr Rogers told Seven News' Robert Ovadia from the scene of the attack. Mr Ovadia later told the program, "people think he deserves some sort of award for being a hero. He doesn't see himself necessarily as a hero but believes he did help save lives and defend his city as well." “Trolley man” spoke to 7 News about the ordeal. The Sunday Herald Sunt tracked down Mr Rogers on a park bench, amid a nationwide bid to find the humble hero, just 24 hours after he risked his life to save others. The newspaper reported that Mr Rogers is homeless, but wasn't concerned when his phone was smashed during the fight, despite not having the means to replace it. Mr Rogers was one of two bystanders who stepped in as the killer tried to claim more victims in the city. Witness footage of the incident uploaded to social media showed Mr Rogers running to one side of the street to get the trolley before pushing it towards Ali who was wielding a knife and lunging at police. The trolley appeared to startle Ali before the man who pushed it tripped and fell to the ground. The terrorist then ran across the road, followed by police, as Mr Rogers got up and gave chase, pushing his cart towards the attacker a second time. 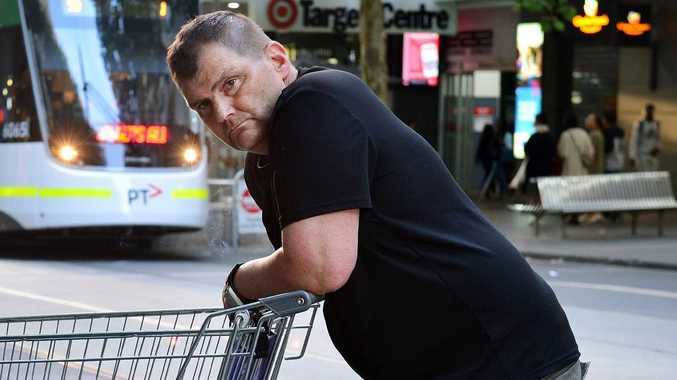 His actions gained him widespread praise on social media by users who dubbed him "trolley man" and called for him to receive a medal or be made Prime Minister of Australia. Mr Rogers was reportedly unaware of the attention being heaped on him for his actions. One witness said she spoke to Mr Rogers at the scene and he told her his actions were "just instinctive to help the police protect the safety of others", the Herald Sun reports. Mr Rogers told 7 News that he believes he did help save lives. "I've seen the trolley to the side so I've picked it up and I ran, threw the trolley straight at him, got him, but didn't get him down," he said. "I did that motion quite a number of times but it just wasn't getting him down." Moments later, Ali was shot in the chest by police, before he died in hospital last night. 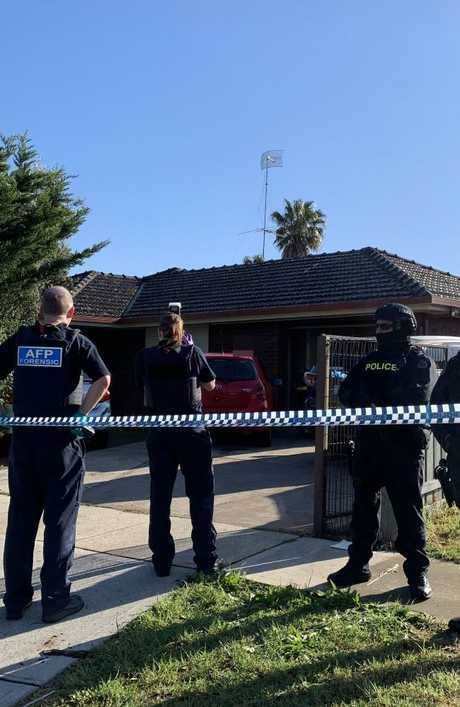 Prime Minister Scott Morrison said the Somali-born attacker, from Melbourne's northwestern suburbs, had violated the nation's trust. "The greatest threat of religious extremism in this country is the radical and dangerous ideology of extremist Islam," he said. A shy and humble Mr Rogers didn’t want to comment further when approached by the Sunday Herald Sun but agreed to pose for this photo with the trolley he used to fend off a terrorist. Picture: Nicki Connolly. Mr Morrison said Ali was one of about 400 people on a national ASIO terror watch list. 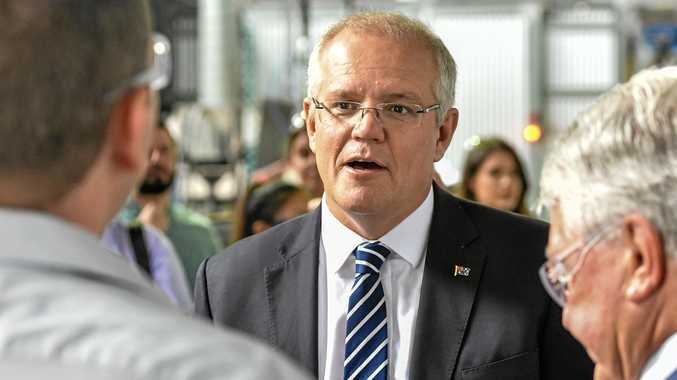 "Here in Australia we would be kidding ourselves if we did not call out the fact that the greatest threat of religious extremism in this country is the radical and dangerous ideology of extremist Islam," Mr Morrison said. "There is a special responsibility on religious leaders to protect their religious communities and to ensure dangerous teachings and ideologies do not take root here." 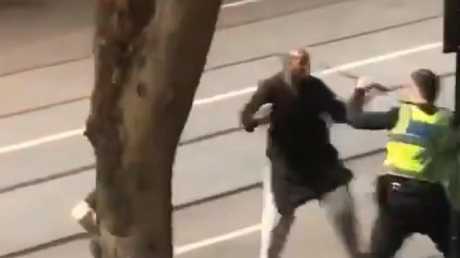 In a press conference on Saturday, Victoria Police confirmed Ali had been known to intelligence agencies for years, but he was not being actively monitored prior to the attack. They said his passport was cancelled in 2015 after ASIO determined he was planning to travel to Syria. According to Commissioner Ian McCartney, Ali was "never a target of the JCTT in terms of the investigations we undertook". "The assessment was made that while he had radicalised views he didn't pose a threat to the national security environment," the commissioner said. "Obviously, the circumstances of how and when he moved from having these radicalised views to carrying them out will be a key focus of the investigation we undertake." He said the tragedy had given authorities a "reality check". "Even with the fall of the caliphate in the conflict zone, the threat continues to be real," he said. "But this is a complex and challenging business." Officers noted that when a person's passport is cancelled due to being a potential terror risk, there are "ongoing daily, weekly and monthly reviews" in relation to the individual. But the commissioner repeatedly stressed that when ASIO cancelled Ali's passport in 2015, the attacker "was not a threat at that time". Officials said the current threat had been mitigated and they do not believe any related individuals - including the attacker's wife, who police have spoken to - pose a terror threat. 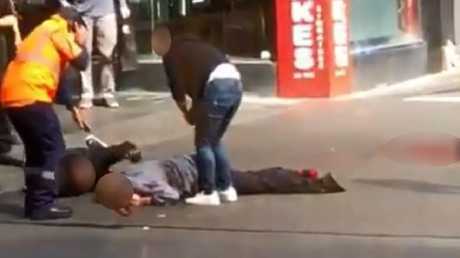 On Saturday afternoon, the Herald Sun revealed incredible new footage of the moment police were forced to shoot Ali. Car horns could be heard blaring as people yelled "shoot him" while the officers back away from the knife-wielding man. Three people were stabbed in the frenzied terror attack, with one victim dying at the scene. 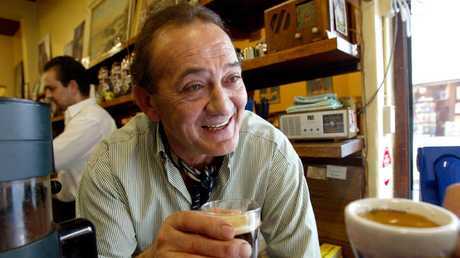 Melbourne coffee icon Sisto Malaspina has been identified as the murdered victim. Staff at Pellegrini's Espresso Bar, a well-known cafe Mr Malaspina had owned for over 40 years, have been in mourning since the incident, The Herald Sun reports. The 74-year-old took over the coffee bar in 1974 and maintained the tradition of the original owners. The popular establishment is well-known for its traditional Italian cooking and longstanding menu. Coffee maker Sisto Malaspina has been identified as the murdered victim in Bourke Street’s terror attack. "Pellegrini's was the number one in the way it did things, the way things should be done - fresh ingredients, taken from the growers to the market to the shop," Mr Malaspina told Hospitality Magazine last year. "Everything done by hand. No mechanisation, no additives. Everything was simple, fresh and beautifully put together. "And it hasn't changed at all. It's still the same menu, prepared in the same way. Slow cooking, no machinery, done by hand … This is the way food should be done. It's not contemporary food. It's secular, traditional, home cooking." Tasmanian businessman Rod Patterson was wounded in the attack. 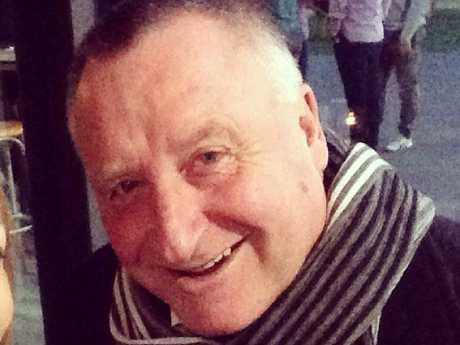 The surviving 58-year-old victim has been named as Rod Patterson, a businessman from Tasmania. In a tweet, Tasmanian Premier Will Hodgman praised him for his bravery, saying "a nicer bloke you wouldn't meet". His wife Maree posted on Facebook that Rod was "doing OK given the circumstances". "Unfortunately we got caught up in the attack in Bourke Street this afternoon and Rodney was hurt - good news is he is in a great hospital and doing OK given the circumstances - can't take calls at the moment but will speak to everyone when I can," she wrote. The 26-year-old victim, who was a security guard, has not been named publicly. An Ambulance Victoria spokesperson earlier revealed that one of the survivors sustained a neck injury and the other, a head injury. 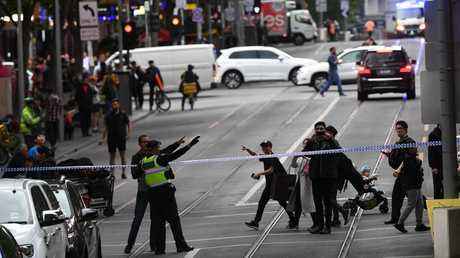 Bourke Street reopened around 6.15am Saturday as investigators finished assessing the scene of the deadly terror attack. 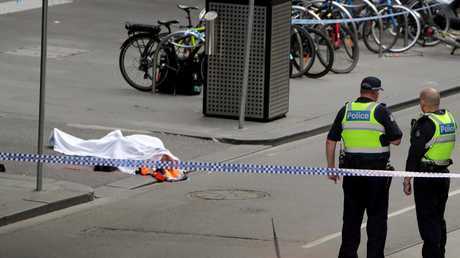 The Melbourne road had been shut off from Swanston St to Russell St as forensics and bomb experts examined the area. 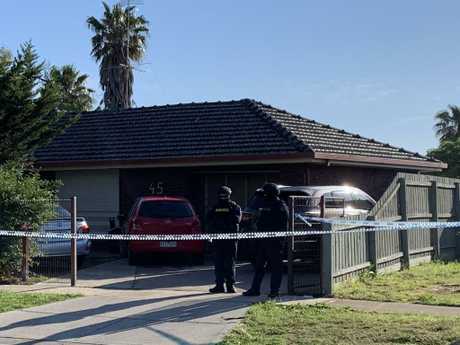 Meanwhile, police surrounded a house linked to Ali with officers standing guard at the Werribee home from around 8am Saturday, The Herald Sun reports. It's understood the attacker's family were inside the house and co-operated with police. Specialist police have swarmed on a house linked to the man behind yesterday's horror Bourke St attack. Imam Isse Musse, a friend of Ali's family, told The Age he had been worried about the 30-year-old's mental health for some time. He said Ali claimed he was being chased by "unseen people with spears" in the weeks leading up to the deadly knife rampage. Police Commissioner Graham Ashton said Ali was known to counter-terrorism authorities, both "at the national level" and to the state police. "We're certainly confident it was a terrorist attack and that's the way we've been treating it overnight," he told The Today Show. "He's pulled up in a car with gas cylinders. It looks like he's attempted to ignite a fire in the car … we believe with a view to ignite these canisters with some kind of explosion, but that didn't eventuate. "Then he's gotten out of the car, we allege with an attempt to cause serious harm to the public." He said Ali has a prior criminal history in relation to driving offences, theft and previous cannabis use. Mr Ashton confirmed police had spoken with the knifeman's wife, in contrast to previous reports that she had gone missing. "We know where his wife is and we have spoken with his wife, and she is not missing," he said. Mr Ashton commended the Victorian police officers' response to the incident, saying: "Obviously it was at their own personal risk when they arrived and intervened and did their duty. It has resulted in the death of the offender. "You can see from the footage, it is fairly dramatic footage that was recorded and has been played on social media. They were very brave at the scene." He also commended members of the public for attempting to support the police in the incident. 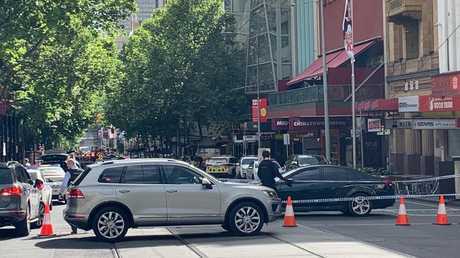 Police said there has been nothing so far to suggest the latest attack was inspired by the James Gargasoulas attack on Bourke Street Mall last January. The Islamic State terror group has taken responsibility for the murderous attack, although the group's Amaq news website provided no evidence for the claim. "The one who executed the ramming and stabbing operation in Melbourne (..) is one of the fighters of the Islamic State and he executed the operation in response to (a call) to target the citizens of the coalition," Amaq said late last night. Bourke Street was blocked off until around 7am this morning. In Saturday afternoon's press conference, Mr Morrison said no religion was immune from extremism and that it took many forms around the world. Mr Morrison said he had longstanding relationships with the Muslim community and it was them who had raised with him their concerns about radicalism in recent years. "I have sat in the living room of a family whose four sons went and fought for ISIS," he said. "And they all died. I have seen the look of complete loss in the eyes of a mother and a father … confused by people who came and corrupted their children." Mr Morrison urged religious leaders to protect their communities to ensure "dangerous teachings and ideologies" didn't spread in Australia. "They must be proactive, they must be alert and they must call this out in their communities," he said, adding the government and wider community needed to work respectfully with them. Mr Morrison also urged Australians not to be intimidated by Friday's attack. "Keep being yourselves, keep being Australians," he said. "Be proud of who you are, because I know you are and that is what will ensure we will always defeat this insidious evil that comes at us every single time." 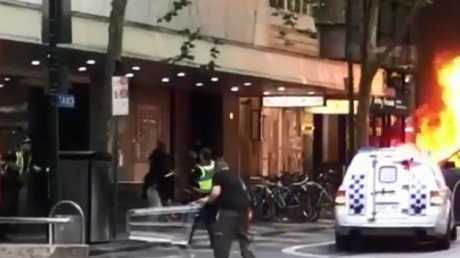 Police will continue to investigate the scene on Bourke Street this morning. "This is an evil, terrifying thing that's happened in our city and state today," Mr Andrews said. 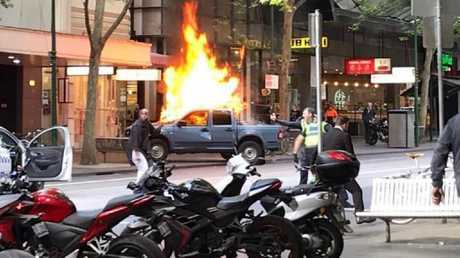 The terror incident began when Ali drove a 4WD into the city about 4.10pm on Friday afternoon and set it on fire. Commissioner Ashton confirmed that several barbecue-style gas cylinders were found in the car and later rendered safe by the bomb response unit. According to the ABC, witnesses saw the man crash the car, get out and throw an object into it that set it alight. Ali then started stabbing members of the public. There were some reports that he yelled "Allahu Akbar" during the attack but authorities later said this had not been confirmed. Meanwhile, police responded to the incident after receiving reports of a car on fire. When they arrived, they were approached by Ali who punched one of them through the car window. Two other officers then got out of the police vehicle and attempted to engage him but Ali appeared to want blood. Footage on social media shows a blue ute in flames and Ali dressed in a black tunic and white pants menacing police with a knife. In an earlier press conference, Victoria Police Superintendent David Clayton told reporters that when the officers got out of the car, they were confronted by a male brandishing a knife and threatening them. It's at this point "the trolley man" and another bystander holding a chair can be seen moving in on Ali in a bid to help police stop him. One witness named Markel told ABC Local Radio in Melbourne that bystanders were urging officers to shoot the man. One person was killed during the attack. Stuart McEvoy/The Australian. Some of the people injured in the attack. Reports on 3AW Radio indicate that witnesses saw the man driving the vehicle "throw something into the back", before the car was ignited. An eyewitness told 7 News it appeared the car was on fire before it crashed and "exploded". This marks the third attack in the area in less than two years. 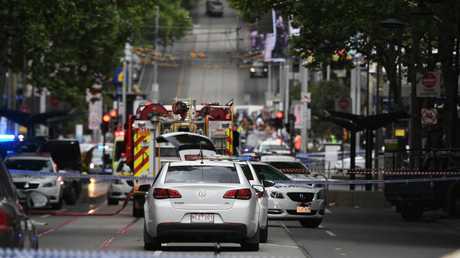 In January last year, six people were killed and 27 injured after a car was ploughed through Bourke Street Mall, with 28-year-old James Gargasoulas standing trial over the attack. Last December, a car mowed down 16 pedestrians outside Flinders Street Station. Saeed Noori, 33, was ordered to stand on trial on murder and attempted murder charges. If you or anyone you know needs help call Lifeline 13 11 14 or beyondblue on 1300 22 4636. 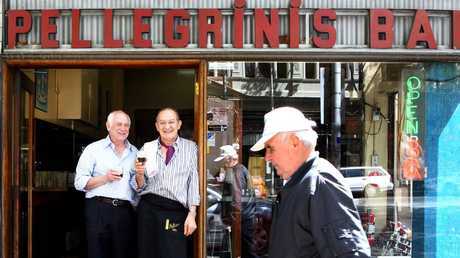 Sisto (middle) pictured with his business partner Nino Pangrazio outside the cafe in 2010. It’s understood the attacker’s family are inside the house and are cooperating with police. Knife-wielding man confronts police. Source: Chris Macheras.